Reason 5: You can't not write in Auvillar. The air is perfumed with roses, the river is silver and green, the laughing gulls sound like tugboats from a children's book. Reason 5: The elders in Auvillar will tell you stories about the war. They will tell you who helped the Nazis, who fought them, and who just tried to get along. Reason 3: The water is kept crystal clear, so that pilgrims, who are walking the past of St. Jacques of Campostelle, the ancient path, can always count on clean water. Reason 2: You can't not write. You will take your poetry to the next level. You will write your heart out. The Morris and Gwendolyn Cafritz Foundation has awarded the VCCA a $25,000 grant to support residences for artists from the greater Washington, D.C. area. Since 1991, the Cafritz Foundation has supported the residencies of nearly 150 visual artists, writers, and composers at the VCCA. It has served as a model for additional regional initiatives, including Pennsylvania and New Jersey. To apply, submit an application form, curriculum vitae and work samples. Please write “Cafritz Foundation” at the top of application. Deadlines: January 15, 2009 for residencies between June and September 2009; May 15, 2009 for residencies between October 2009 and January 2010; and September 15, 2009 for residencies between February 2010 and May 2010. Marilyn Kallet has been blogging on RedRoom.com about the Top 10 Reasons to attend her poetry workshop (June 12-18, 2009) at our studio center in Auvillar, France. Today, reasons 10-6. Check back on Monday for reasons 5-2, plus the Penultimate Reason. Number 10: You can buy 2005 Bordeaux at the supermarket in Valence d'Angens for about 4 Euros. Some of these wines you will not find in the United States. They are the color of rubies in a sunset, and they taste even better than their gleam. Number 9: The cheese dealer in the open market at Valence looks like Antonio Banderas, and he likes American women. Number 8: The villagers are so friendly that your French will come back to you--even if you have no French. Number 7: The sunlight on the Garonne River changes its countenance moment-by-moment. Number 6: The cognac and Armagnac dealers in the open markets give samples. Click here for more information and to register. You may also email Marilyn. Because of your gifts, the VCCA continues to provide a constant, inspiring and nurturing environment for the world's finest writers, visual artists and composers. Your continued support is needed now more than ever. As 2008 comes to an end, please remember us in your holiday giving. If you have not already done so, you may make a donation online, or send your gift to: VCCA Annual Fund, 154 San Angelo Drive, Amherst, Virginia 24521. Thank you. All of us at Mt. San Angelo wish you the happiest of holidays. Congratulations to VCCA poets Nickole Brown, Henri Cole and Loren Graham, who are among the 42 recipients of the prestigous National Endowment for the Arts grant, awarded annually. The $25,000 award is given to support writing fellowships. From the NEA: "Literature Fellowships are the Arts Endowment's most direct investment in American creativity, encouraging the production of new work and allowing writers the time and means to write." Credits, from top: Henri Cole (photo by Star Black), Lauren Graham (Carrol College photo) and Nickole Brown (from ohioriverbooks.com). Partnering with VCCA Fellows, the VCCA will again offer a series of arts workshops next summer at Moulin à Nef, our own exquisite studio center in the charming village of Auvillar, France. 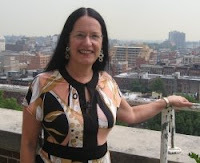 Poets: "Revive Your Senses in Deep France" with poet Marilyn Kallet. 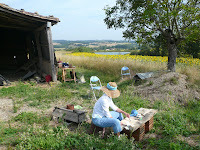 Writers and painters: mix your palette of words and colors with painter Mary Page Evans and poet Elizabeth Seydel Morgan as they bring their Plein Air Workshop to France for its second year. Composers: join John Aylward, David Rakowski, Beth Wieman, James Wiznerowicz and Guest Ensemble ECCE for the opportunity to workshop, perform and record a work of your choice at "Etchings, A Festival for Contemporary Music." Visit our website for dates, fees and additional information and registration or contact Lila Heasley.